Now, before you start getting excited and start jumping up and down, this is all still RUMOUR! It will stay that way until Disney confirm but current port schedules give us some indication that Disney are at least considering the return of the Disney Magic between May and October 2013. During the summer of 2011, Disney brought the Wonder over to Europe for an extended period and during its time here we spoke to several cast members aboard who expressed some of the difficulties the ship had been having in Europe. With it being an American ship, they would have to bring the boat over fully stocked for a long period of time. Now, boats have a legal load limit just like any other form of transport and the Magic would have breached that if it had loaded itself for its full stay. Instead, it had to rely on European distributors bringing deliveries at certain points during it cruise. On occasions during 2011, these deliveries did not arrive on time and the cruise ship was much lower on stock than they would have liked (I can say from experience it wasn’t noticeable). Because of this, Disney were going to hold off any more cruises to the Med until these problems had been ironed out. This possible news mean that they have solved the issues they have had OR this is one big cover up and Disney are just booking to make sure they get space. So, what is the reason for us beginning to spread these wild rumours? The answer – Port Schedules. At the beginning of January, several European ports updated their schedules for 2012 and 2013. This is a record that shares information about when and where ships will be if they are docked in port in that country. We must say that these schedules can changes very quickly and because a boat is currently scheduled to dock there doesn’t mean it will. Look at the changes made to the last European cruise where Disney decided to avoid the violence in Africa altogether. In fact, while we were onboard we missed a whole day in Majorca due to transport strikes and instead returned to Barcelona a day early. It can happen that quick. What we have gleaned so far is the following. Disney Cruise line in the next few weeks is expected to announce the return of the Disney Magic to Galveston, Texas at the beginning of 2013. It will reside their until the end of May and will then make a transatlantic crossing to Europe beginning 18th May 2013. It’s first expected port of call in Europe will be Madeira, Portugal on the 28th May and their port schedule gives us some clues as to how we know. You might look at the image above and think nothing of it. It is strange to begin with that all other entires for that month give a clear indication of the company and boat that will be docked except for this one. There is no such company as “TBA” to start with. But it is the extra details that gives it away . The length of this specific ship is said to be 294. Is that feet or metres? The Disney Magic is 964 feet, which equates to 294 metres. 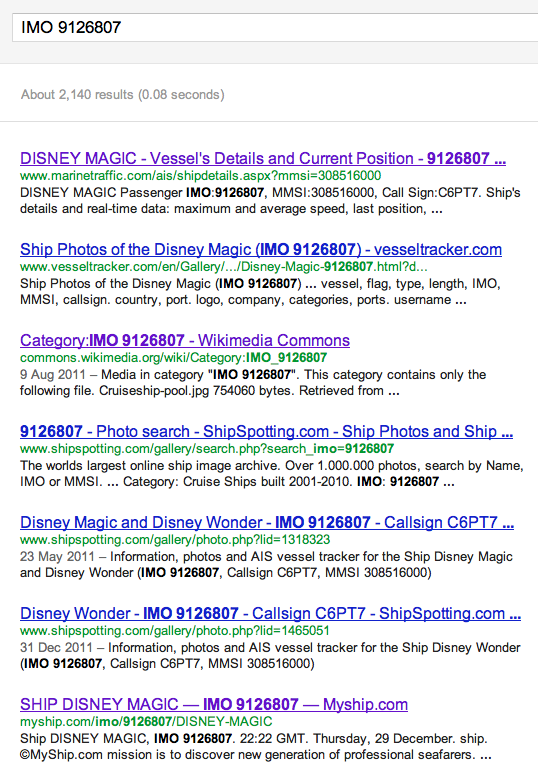 A coincidence maybe, but when we look at the ships IMO number “9126807” and then enter it in to Google. Now, that many websites can’t be wrong! The ship is currently scheduled to return to Maderia on the 16th October with a port scheduled in the St Maarten, Caribbean on 22nd October. Around enough time for it to make a transatlantic crossing back to US waters. The only other port currently booked in for the Disney Magic is Villefranche (also on the itinerary for 2011) and dates are erratic. Some port visits are scheduled 2 days apart while some are as much as 12. It could suggest a 12 night cruise or even a stop in Cannes as a change but it could also could suggest Disney are yet to fully make up their minds. Either way, we should find out soon. Disney are to hold a press conference in Miami next week (Wednesday) where they are expected to announce the Disney Wonder’s berth in 2013 and rumours suggest the booking of Transatlantic crossing to Europe could be as early as next weekend. Finally, there seems to be mixed messages as to the location of the ships home in Europe. So far, there has been mention of 4 ports. Some suggest the Disney Magic will berth in the UK, with likely spots being Southampton or Portsmouth. There has also been talk of a return to Barcelona and even Citavecchia (the gateway to Rome). All ports will give the cruise other areas to discover beyond what was seen in 2011 but it is certainly an interesting prospect to those wanting a bit of Disney Magic without flying miles to a Disney theme park. When the Madeira port schedules first went up the Magic was listed by name and news broke all over the web – it was a few days later that somebody ‘decided’ to change the site. The Gibraltar port authority web site is still showing bookings for the Disney Magic on 13 May 2013 and 14 October 2013. I really hope they come back next summer. We had a really great week and it would be amazing if they go for the Eastern Med. We’ll be on it!